Interior of the Camposanto cemetery. If you go to the Piazza dei Miracoli in Pisa, you will have to buy tickets to visit the buildings. Combination tickets are available, and you can choose whether you want to see just one or several attractions, or everything. Since there was a long queue of people waiting to climb the Leaning Tower and we had already seen several baptisteries during our vacation, we decided to buy a ticket for the Duomo and for the Camposanto cemetery, the fourth and final monument on the Square of Miracles. Camposanto translates as “holy field” and the name refers to the fact – or at the very least the widely held belief – that the edifice constructed here was built on holy earth brought to Pisa from the hill of Golgotha in Palestine. What we see today is a large and elegant rectangular cloister. Construction started in 1278 under Giovanni di Simone, an architect who also worked on the Leaning Tower. The Camposanto was not completed until 1464. Of the three chapels that are part of the complex, the Cappella Dal Pozzo was built in 1594 by the archbishop of Pisa Carlo Antonio Dal Pozzo. Interior of the galleries and entrance to the Cappella Dal Pozzo. 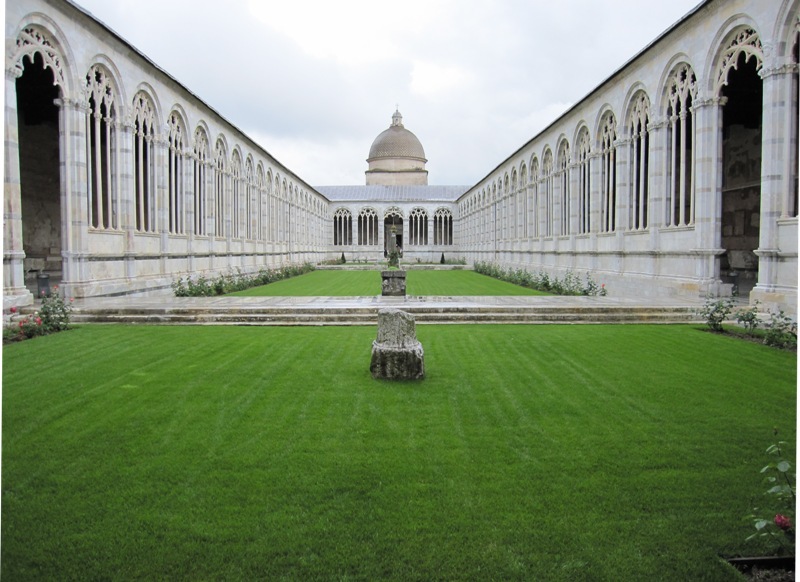 While the exterior of the Camposanto complex is simple and inconspicuous, the interior is beautiful. In the middle is a field of grass that is about as long as a football field (ca. 105 metres) and little under 20 metres wide. Notable citizens – for instance professors from the University of Pisa – were buried here until the eighteenth century. The Camposanto became a museum in the early nineteenth century. The whole complex has an exceptionally serene atmosphere and is definitely worth a visit. The walls of the cloister used to be covered in colourful frescoes. Regretfully, these were seriously damaged during an allied bombing raid in 1944. A bomb fragment caused a fire, which destroyed the roof and ruined everything in the interior galleries: frescoes, sarcophagi, statues and the like. Fortunately, after the war, attempts were quickly undertaken to restore the frescoes. Apparently, this is still work in progress. 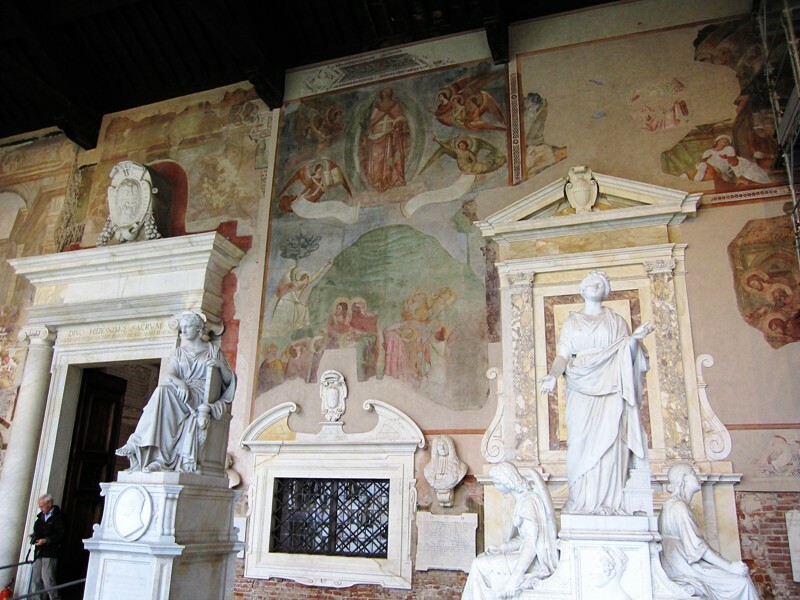 When we visited the Camposanto in 2010, the visitor could at least admire the restored frescoes attributed to Bonamico Buffalmacco, a painter who was active in Pisa between 1336 and 1341 (according to the captions). 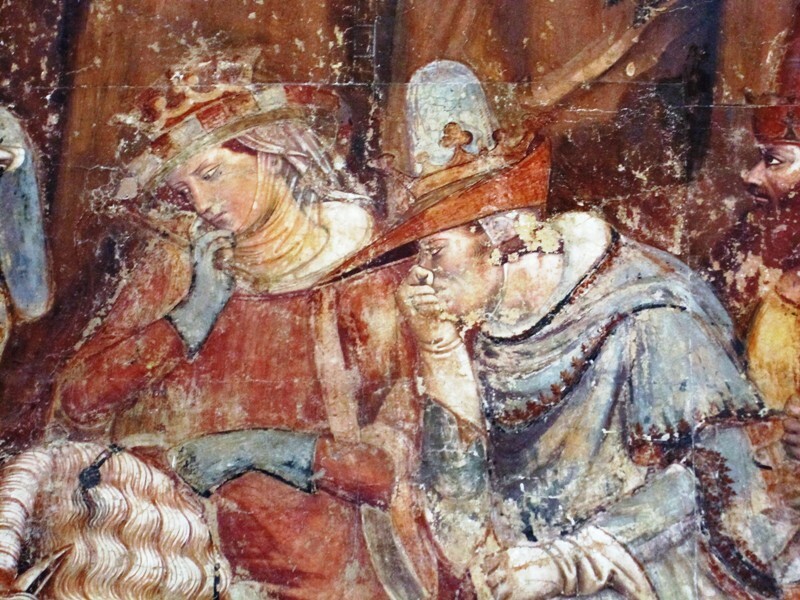 It is quite possible that during the last few years more restored frescoes have been put back on display. Detail from The Triumph of Death. Of Buffalmacco’s work, we saw Last Judgment and Hell and The Triumph of Death. Although the frescoes are still damaged and the colours are a bit mat, it is still possible to see the wonderful details that Buffalmacco added. See for instance the picture on the right, which is a detail from The Triumph of Death. The nobleman and the lady – perhaps of royal blood, judging by their crowns – are looking at the three corpses on the left. The nobleman holds his nose because of the horrible smell that comes from the coffins. It is fortunate that the frescoes here were saved and restored, but one can only wonder how grand the complex must have been when they were all still 100 percent intact. Update 25 August 2017: pictures have been updated.